We're baking dessert at the playground today to celebrate Laura Bradford's new book, Eclair and Present Danger. 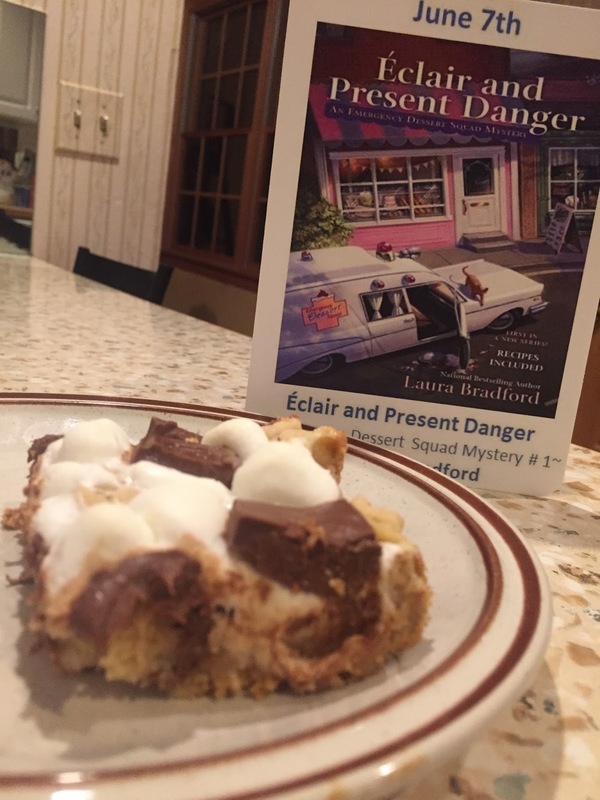 This novel is the first in the new Emergency Dessert Squad Mystery Series and the S'more bars look delicious. For Mystery Playground, I decided to tweak Winnie’s favorite S’more Bar recipe (which, in keeping with her Emergency Dessert Squad theme, is aptly named, Worry No s’More Bar) by using mini Reese’s Peanut Butter Cups instead of chocolate chips. Something tells me, Winnie would approve (I know my kids sure did). While I love so many things about this series—the characters, the setting, the “emergency dessert” them concept—one of my favorite parts is coming up with ways to alter dessert names to fit a problem. Like Hot Flash Fudge Sundaes (for women going through menopause) or Dump (Him/Her) Cake for that friend who needs encouragement to end a bad relationship. With each new book in this series, Winnie will add more fun emergency desserts to her menu, which means there’s going to be a whole lot of giggling going on at my keyboard. 1. Line a square baking pan with parchment paper and set aside. 2. Combine crushed graham crackers and 4 tablespoons of melted butter. Press into bottom of prepared pan to form a crust. 3. Cream ½ cup of softened butter. Mix in both sugars and cream again until fluffy. Add in egg and vanilla. Mix again. 4. In a separate bowl, combine flour, baking soda, and salt. Add to butter mixture and combine. 5. Add in peanut butter cups and marshmallows. Stir. 6. Spoon cookie dough on top of graham crust and spread (dough will fill in any gaps as it cooks). 7. Bake at 350 degrees for 10 minutes. 8. While bar is cooking, place mini chocolate bar in freezer. 9. After 10 minutes, sprinkle reserved marshmallows on top of cooking bar and then continue baking for another 8 to 10 minutes. 10. Remove from oven and place chocolate bar pieces on top. Cool completely. You can find Laura on Facebook and occasionally on Twitter @bradfordauthor. I will try this dessert. The names of your books are so much fun! I will have to read them. Thanks for the interview. Yum, smores indoors?!?! It is almost too hot here to have an outdoor fire, I will have to try these.